Jugular venous catheters allow for central administration of medications, frequent blood draws and central venous sampling. While standard of care for placement of central venous catheters (CVCs) involves ultrasound guidance, physicians should be aware of the traditional landmark approach to line placement. This means having a detailed knowledge of the anterior and posterior triangles of the neck, specifically the division of the sternocleidomastoid into the clavicular and sternal heads, as shown in Figure 1 and Figure 2. This review will summarize the anatomy involved in the placement of a jugular venous catheter and possible complications. The sternocleidomastoid muscle divides the neck into two triangles. The posterior triangle has the sternocleidomastoid muscle anteriorly, the trapezius posteriorly, and the clavicle inferiorly. This area contains the brachial plexus. The anterior triangle is contained within the mandible superiorly, the midline of the neck anteriorly and the sternocleidomastoid posteriorly. 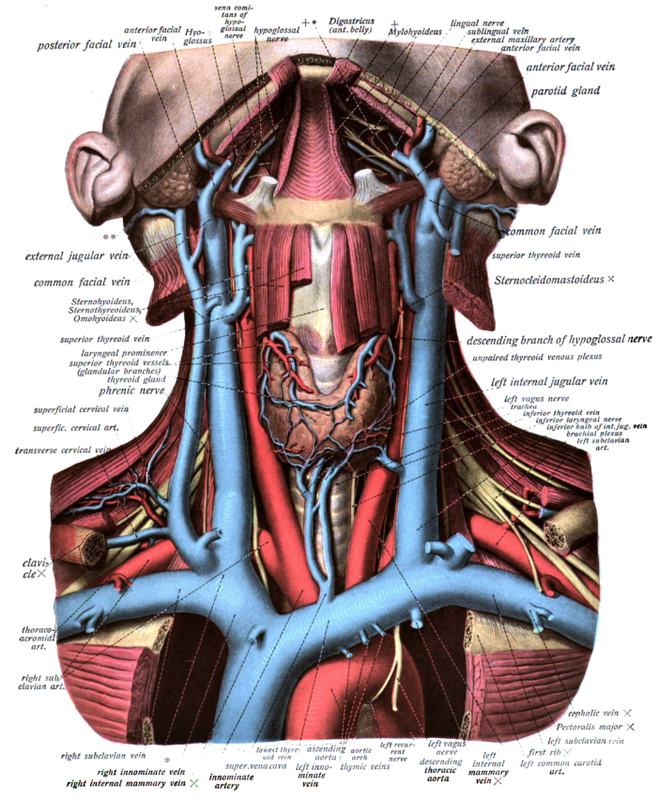 Within the anterior triangle lie the internal jugular vein, the carotid artery and vagus nerve. 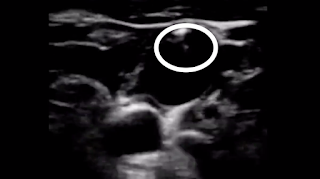 [3,4] The internal jugular vein lies most anterior and lateral, and a physician can confirm the orientation of a patient’s vessels via ultrasound, as shown in Figure 3. The common carotid artery and, as the artery progresses cranially, the internal and external carotids, lie medially and dorsally to the internal jugular vein. [3,4] The right internal jugular vein travels posteriorly to the sternocleidomastoid and emerges between the sternal and clavicular heads of the sternocleidomastoid muscle. This division provides a site for placement of a jugular venous catheter. After entering the thoracic cavity, the right internal jugular vein will meet with the right subclavian vein as it moves towards the heart and forms the right brachiocephalic vein. This proceeds into the superior vena cava and then the right atrium. 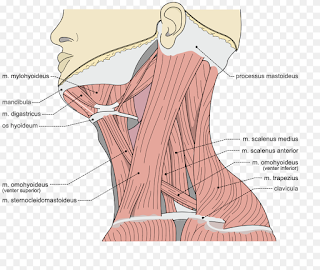 The surface landmarks for the placement of a jugular venous catheter are a horizontal line from the thyroid cartilage drawn straight across the neck and the sternocleidomastoid muscle. Where these bisect, the sternocleidomastoid muscles divides into the clavicular and sternal heads. The internal jugular vein normally proceeds laterally to the sternal head of the sternocleidomastoid muscle. 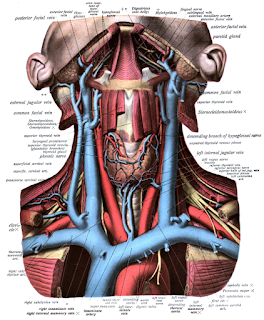 The carotid artery normally lies directly beneath this head of the sternocleidomastoid. There are variants to these locations and ultrasound can elucidate if a patient’s anatomy varies from the norm. Once the physician establishes these landmarks, they can start the procedure. The neck is first prepped with either Betadine or chlorhexidine. The proceduralist drapes the area and dons sterile gloves. The patient should be placed in Trendelenburg position to increase the size of the right internal jugular vein and then the head should be rotated to the left to increase accessibility. Furthermore, the right jugular vein has a greater diameter than the left in most patients. Due to this increased size and shorter distance to the heart, most physicians choose the right over the left for placement of the catheter. An ultrasound is used to determine the exact location of the interior jugular vein in relation to the common carotid artery. The vein will typically be anterolateral to the artery and just lateral to the sternal head of the sternocleidomastoid. A 20-gauge needle is placed on a 10 mL syringe. This is entered into the skin over the vein at a 45-degree angle with the bevel up. After passing the epidermis, the plunger of the syringe is retracted to create a negative pressure. This will allow blood to enter the syringe when the physician achieves access to the vein. The physician will follow the tip of the needle with the ultrasound probe. When the operator punctures the vein, dark red blood should enter the syringe. Pulsating blood may indicate placement in the common carotid artery. After achieving access, the Seldinger technique is used for placement of the catheter. The physician should check the needle placement using an ultrasound in both the transverse and longitudinal views. A needle in the transverse view is shown in Figure 4. First, a guide wire is threaded through the needle and into the right internal jugular vein. The needle is then removed while the physician maintains control of the guidewire. At this point, the ultrasound probe should be used to confirm placement of the guidewire into the vein. Figure 4 shows a guidewire in the internal jugular vein on ultrasound. A 10-blade is then used to make a small incision along the guidewire’s entry point to ease the access of the dilator. The incision should only be a few millimeters deep. The dilator is then threaded over the guidewire and into the vein. This will dilate the opening into the vein to allow the catheter to enter next. The dilator is then removed. At this point, significant bleeding can occur. Therefore, the physician must move quickly and hold pressure when necessary. The catheter is then threaded over the guidewire and into the vein. The tip of the catheter will be threaded into the right atrium of the heart. Table 1 shows these steps in a step-by-step format. Although this procedure is normally conducted successfully, a minority of the time there will be complications. The rate of these complications is study-dependent and appears to be related to catheter size and operator experience. [8, 9] The complications from jugular venous catheter placement include infection, thrombosis, occlusion, and pneumothorax. A pneumothorax may occur if cannulation of the guidewire or catheter pierces the parietal pleura. This will cause air to enter the parietal cavity between the parietal pleura and visceral pleura. If the pneumothorax is less than 15% of the parietal cavity, the pathology can be managed with close observation and high flow oxygen. If a tension pneumothorax occurs, needle decompression/chest tube placement is necessary. Physicians in emergency medicine and critical care must know the anatomical gap created by the sternal head and clavicular head of the sternocleidomastoid. This gap allows for quick access for central line placements in most patients. Without proper knowledge of this area, costly complications may occur and hinder patient care. 1. Marieb E, Wilhelm P, Mallatt J. Human Anatomy, Vol 6. San Francisco, CA: Pearson Education; 2011. 2. Avila J. Central Line Placement. 5 Min Sono Vids. Available at http://5minsono.com/cvc/. Updated September 24, 2015. 3. Agur A, Dalley A. Grant’s Atlas of Anatomy, 12e. Philadelphia, PA: LWW; 2009. 4. Turba UC, Uflacker R, Hannegan C, Selby JB. Anatomic relationship of the internal jugular vein and the common carotid artery applied to percutaneous transjugular procedures. Cardiovasc Intervent Radiol. 2005. 28(3):303-6. 5. Parry G. Trendelenburg position, head elevation and a midline position optimize right internal jugular vein diameter. Can J Anaesth. 2004. 51(4):379-81. 6. Giordano CR, Murtagh KR, Mills J, Deitte LA, Rice MJ, Tighe PJ. Locating the optimal internal jugular target site for central venous line placement. J Clin Anesth. 2016. 33:198-202. 7. Seldinger SI. Catheter replacement of the needle in percutaneous arteriography; a new technique. Acta radiol. 1953;29(5): 368-76. 8. Sznajder JI, Zveibil FR, Bitterman H, Weiner P, Bursztein S. Central vein catheterization. Failure and complication rates by three percutaneous approaches. Arch Intern Med. 1986;146(2):259-61. 9. Tsotsolis N, Tsirgogianni K, Kioumis I, et al. Pneumothorax as a complication of central venous catheter insertion. Ann Transl Med. 2015;3(3):40. 10. Kornbau C, Lee K, Hughes G, Firstenberg M. Central line complications. Int J Crit Illn Inj Sci. 2015;5(3):170-8.